Background and aims To assess whether aspartate aminotransferase (AST), alanine aminotransferase (ALT) and alkaline phosphatase (AP) levels can predict the diagnosis of primary biliary cholangitis (PBC) or any other diagnoses and whether PBC occurs either simultaneously or independently of other liver diseases among antimitochondrial antibody (AMA)-positive patients. Methods Demographic and clinical variables were assessed in 90 AMA-positive patients with and without liver biopsies. These patients were further categorised as having a diagnosis of PBC, overlap syndrome or ‘not established with a diagnosis of PBC’. Receiver operating characteristic curves were constructed to determine the thresholds of liver enzymes that predict these three diagnoses. Results The 48 patients with liver biopsies were more frequently female and had significantly higher AP levels compared with the non-liver biopsy group. Based on liver biopsy findings, 12, 12 and 22 patients were assigned a diagnosis of PBC, overlap syndrome with autoimmune hepatitis and PBC and ‘not established diagnosis of PBC’, respectively. Seven of 12 patients classified as PBC had AP level of ˂200 IU. AST, ALT and AP levels were significant predictors of a diagnosis of overlap syndrome compared with the rest of the patients; however, these tests were not discriminatory between diagnoses of PBC and ‘not established with PBC’. Findings of fatty liver and bile duct injury on liver biopsies were not significantly associated with any liver test pattern. Conclusions As the liver test pattern did not correlate with the liver biopsy findings of PBC or other non-PBC diagnoses in AMA-positive patients at risk for other disease, a liver biopsy and/or non-invasive liver assessment along with serum liver tests should be interpreted to complete liver evaluation. What is already known about this patient population? Primary biliary cholangitis (PBC) can occur at any level of alkaline phosphatase (AP). At a higher level of AP, PBC can be diagnosed without a liver biopsy provided that the antimitochondrial antibody (AMA) is positive. Patients with high AP and high aspartate aminotransferase (AST) levels should undergo a liver biopsy to diagnose the overlap of autoimmune hepatitis with PBC. Liver biopsy and/or non-invasive tests should be considered in AMA-positive patients with lower AP levels to identify patients at risk for fatty liver. 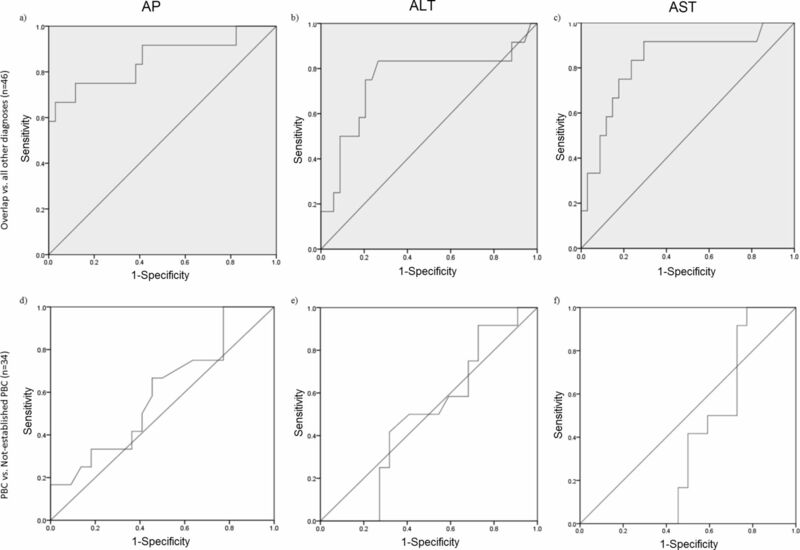 In a community practice, liver biopsies are more likely to be performed in patients with higher rather than lower AP levels among AMA-positive patients. Compared with a tertiary centre, a diagnosis of PBC can be documented at a lower AP level in a community practice. The yield of a liver biopsy for the diagnosis of PBC in patients with a positive AMA and a lower AP level is substantial; the use of cytokeratin-19 or cytokeratin-7 stains can further highlight early changes of PBC on a liver biopsy. Despite undergoing a liver biopsy, many AMA-positive patients would not be diagnosed with PBC and other diseases such as nonalcoholic fatty liver disease (NAFLD) could be documented. A liver biopsy should be considered in AMA-positive patients with a lower AP regardless of AST level where the diagnosis of PBC cannot be established with liver tests alone or there exists the possibility of another liver disease. Moreover, among those AMA-positive patients with higher AP and lower AST levels where liver tests alone can make the diagnosis of PBC, a liver biopsy may find additional or alternate diagnoses. Non-invasive tests or a liver biopsy could be considered to evaluate other underlying diseases such as NAFLD that can be concomitantly present along with PBC. In our hepatology practice at Maricopa Integrated Health Centre (MIHS), a safety-net hospital in Phoenix, Arizona, AMA has been included in the battery of liver tests that are used for liver disease evaluation. We have encountered patients with a positive AMA who exhibited a variety of patterns of liver tests who eventually were found to have other liver diseases present besides PBC and/or in whom a diagnosis of PBC could not be established. We sought to assess the clinical characteristics and differences among AMA-positive patients with or without a liver biopsy. Furthermore, we analysed AMA-positive patients with liver biopsies to find any particular liver tests that could reliably differentiate liver pathology features and assist in assigning a specific and accurate diagnosis to each patient. Maricopa Medical Centre (MMC) is a state-owned hospital that fulfils primary healthcare needs of patients who are insured by the state or are uninsured. The hepatology clinic receives consults from MMC’s emergency department, hospital discharges and family health clinics owned by MIHS with only occasional consults received from community gastroenterologists. Electronic medical records (EMRs) at MIHS in Phoenix, Arizona, were accessed to review patient records for this retrospective study approved by the institutional review board. Data including demographics, weight, alcohol/drug abuse, diabetes mellitus (DM), liver imaging (ascites, varices, fatty liver), liver tests, antinuclear antibody (ANA) and F-actin antibodies, upper gastrointestinal endoscopy (EGD) findings (varices) and liver biopsy results were collected. The highest available values (in one collection) among all the documented levels of AP, total bilirubin, alanine aminotransferase (ALT) and AST before initiation of ursodeoxycholic acid (URSO) therapy were recorded; the lowest level of serum albumin was also recorded. The semiquantitative detection of mitochondrial antibodies was conducted using the QUANTA Lite M2 EP (MIT three antigen) ELISA with a cut-off value of 25 determined to be positive for AMA. The sensitivity and specificity for this test has been reported as 87.3% and 98.7%, respectively.10 11 F-actin antibody and ANA were reported positive if the values were above 19 units and above 1:40, respectively. Ascites or esophageal varices were marked present if documented on imaging, EGD reports or provider notes. Variables including bile duct injury, fatty change, fibrosis, cirrhosis and nonalcoholic steatohepatitis (NASH)were extracted from liver biopsy reports. Thirty-six of 48 biopsies were read by one of the five pathologists at MIHS. For 23 patients, biopsies were sent out for a second opinion from an expert hepato-pathologist. A diagnosis of overlap syndrome of AIH and PBC was determined based on the Paris criteria.12 Those patients who had bile duct injury on the liver biopsy and did not fulfil Paris criteria for the overlap syndrome were classified as PBC. Patients who didn’t fulfil Paris criteria or had no evidence of bile duct injury on the liver biopsy were labelled as ‘not established with PBC’. All statistical analyses were conducted using SPSS 21. Continuous variables were assessed using Kruskal-Wallis and Mann-Whitney tests and categorical variables by using Fisher’s 2-sided exact tests. Receiver operating characteristic curves (ROCs) were created to determine the optimal cut-off levels (least misclassification) of AP, AST and ALT to determine a correct diagnosis of PBC or overlap syndrome and of patients who could not be established with a diagnosis of PBC. The area under the ROC for liver enzymes (AP, ALT and AST) in predicting the diagnosis of overlap, PBC and non-established with PBC based on liver biopsies were reported. We also reported the recommended liver enzyme thresholds for optimum sensitivity and specificity (least misclassification) of the liver disease diagnoses based on ROCs. We identified 90 AMA-positive patients, 48 with liver biopsies, from January 2012 to September 2015. Data on 46 of 48 patients with liver biopsies were collected before initiation of URSO therapy. Two patients had liver biopsies performed at an outside facility, and since data and histology prior to URSO initiation was not available, they were excluded from the final statistical analysis of the liver biopsy group. The median APRI and FIB-4 scores for all 90 patients were 1.71 and 1.96, respectively (table 1). As APRI and FIB-4 were designed for patients with only a moderate degree of AST/ALT elevation and a moderate reduction of platelet count,14 15 we excluded patients with AST˃200 IU/L and/or ALT level of ˃200 IU/L and/or platelet count of ˂20 000 cc/mm3. The mean (median, range) APRI for 30 patients who underwent a liver biopsy was 2.4 (1.5, 0.5–8.9) compared with 1.5 (0.9, 0.2–7.1) for 36 patients without a liver biopsy (p=0.057). Mean (median, range) FIB-4 was 3.3 (2.0, 0.7–14.2) for liver biopsy patients and 2.7 (1.4, 0.5–17.88) for non-biopsy patients (p=0.046). The corresponding author reviewed data on patients without liver biopsies and assigned a diagnosis of PBC to eight patients with a mean AP level of 455 IU (range 196–492). None of the patients in the no liver biopsy group had a suspected overlap syndrome. The number of females and AP level was significantly higher in the liver biopsy group (n=48) compared with the no liver biopsy group (n=42). Mean levels of AST, ALT and total bilirubin were numerically higher and serum albumin lower in the liver biopsy group compared with those who did not have liver biopsies, but the differences were not statistically significant. Based on liver biopsy findings and Paris criteria, a diagnosis of PBC, overlap syndrome and ‘not established with PBC’ were assigned to 12, 12 and 22 patients, respectively. Twenty-six of 90 patients were on URSO therapy at the time of data collection. Of these 26 patients, 22 had liver biopsies. Additional data were collected on all except two patients prior to URSO exposure to allow baseline pretherapy information to be used in our statistical calculations. These two patients showed liver biopsy changes compatible with and diagnostic of PBC and were not analysed in the final data set. Table 2 summarises epidemiological, liver biopsy and other clinical variables. Four of six patients whose liver biopsies were stained with CK-7 or/and CK-19 showed paucity or absence of CoH in the peri-portal zone; however, there was no correlation between level of AP, presence or absence of bile duct injury on H&E stain and paucity or absence of CoH. Three patients with paucity of CoH highlighted on CK-7 and/or CK-19 staining didn’t show any evidence of bile duct injury on H&E. All 12 patients diagnosed with overlap syndrome showed some bile duct injury. Only one patient diagnosed with overlap syndrome did not have hepatitis but fulfilled the Paris criteria. Average mean, median and range of IgG, IgM and IgA levels were available from 10 overlap patients: IgG: mean, 1906 mg/dL; median, 1753 mg/dL; range 928–3030 mg/dL; IgM: mean, 642 mg/dL; median, 451 mg/dL; range 105–3000 mg/dL; and IgA: mean, 337 mg/dL; median, 292 mg/dL; range, 142–602 mg/dL. Cirrhosis and markers of portal hypertension including ascites and varices were seen more frequently among patients with overlap diagnosis, but the differences were not statistically significant. All patients with hepatitis C and/or hepatitis B were included in the ‘not established with PBC’ group. Eight patients had both bile duct injury consistent with PBC and fatty change consistent with NAFLD documented on their liver biopsies. One patient who was categorised as NAFLD based on the initial liver biopsy underwent a second biopsy 10 years later (after data collection) and showed severe ductopenia and confirmed changes of PBC. While the first liver biopsy showed a normal number of expected CoH and steatohepatitis, the second liver biopsy showed complete absence of CoH, ductopenia, stage IV PBC and a lesser degree of steatohepatitis. AP levels of this patient trended up over time but remained under 200 IU throughout the illness course. Table 3 summarises the differences in liver tests between three groups of patients with liver biopsies. AST, ALT, AP and total bilirubin values were significantly higher in overlap syndrome compared with ‘non-established with PBC’ and PBC groups. Patients categorised as PBC had the lowest AST and ALT values, but there was no significant difference compared with the non-established with PBC group. The mean AP levels were numerically lower and AST/ALT levels were numerically higher in the non-established with PBC group compared with the PBC group, but the differences did not achieve statistical significance. Seven patients with a diagnosis of PBC had an AP level of ˂200 IU. A non-parametric ROC plot of AP for distinguishing between overlap (n=12) and non-overlap (n=34) diagnoses among AMA patients with liver biopsy results showed an area under the curve of 0.853 (p<0.001, figure 1). The cut-off/threshold for AP to achieve the optimum sensitivity and specificity (least misclassification) of overlap versus non-overlap diagnosis was at 485 IU. Similarly, the ideal ALT cut-off was 75.5 for the diagnosis of overlap (AUC=0.750, SE=0.833, Sp=0.735, p=0.11) and the best AST cut-off was determined to be 86.5 (AUC=0.830, SE=0.917, Sp=0.706, p=0.001). ROC-determined liver enzyme cut-offs to differentiate between PBC and not-established PBC were not discriminatory for AP (AUC=0.563, p=0.556), ALT (AUC=0.449, p=0.632) and AST (AUC=0.354, p=0.173). Non-parametric receiver operating characteristic curve plot of three liver enzymes in distinguishing between overlap versus other diagnoses (grey shaded, (a–c) and PBC versus not established PBC (d–f) in AMA-positive patients from a community hepatology practice. ALT, alanine aminotransferase; AP, alkaline phosphatase; AST, aspartate aminotransferase; PBC, primary biliary cholangitis. Data from a tertiary hospital that used 240 IU as the upper limits of normal (ULN) for AP in their own cohort of patients (all with liver biopsies) convincingly documented that an AP level of ≥1.5× ULN and AST of ˂5× ULN had a 98.5% positive predictive value for the diagnosis of PBC. However, in contrast to our data where the AP level was much lower and the majority of AMA-positive patients could not be diagnosed with PBC, only 25/156 patients in their study were diagnosed with diseases other than PBC. Nine patients were diagnosed with an overlap of AIH and PBC; these patients were categorised separately from the PBC patients and curiously had significantly lower AP levels compared with the PBC group. All patients had liver biopsies, and an AP level of 526 IU was documented to have 95% sensitivity for histological correlation with a diagnosis of PBC. The researchers concluded that a liver biopsy is not necessary for the diagnosis of PBC in patients with a high AP and low AST but should be considered in those who have high AST and high AP levels to diagnose overlap syndrome; however, the evaluation of patients with low AP and low AST levels was not discussed.1 The differences in laboratory data between our primary care practice and data reported from this tertiary centre reflect the patient referral trends in these two hospital systems. While the odds of making a correct diagnosis of PBC are high among AMA-positive patients with high AP levels,1 those with lower AP values21 could be missed with early PBC or advanced liver disease without the performance of a liver biopsy.3 32 In our practice, patients with lower liver enzymes and appearance of fatty liver and/or hepatic decompensation on imaging studies did not undergo liver biopsy (table 1). Our data corroborate the findings of a recent report that documented that AMA-positive patients with normal AP and less liver disease typically do not undergo a liver biopsy5 and support that the yield of liver biopsy for the diagnosis of PBC or other diagnoses is in fact substantial in these particular patients. AMA-positive patients with a normal or near normal AP who did not undergo a liver biopsy are labelled ‘non-established with PBC’ or, if they have undergone a liver biopsy and show subtle changes of PBC yet do not fulfil histological criteria, are categorised as ‘compatible’ with PBC. Such patients have been shown to be at risk for progression to overt PBC.2 5 We found loss of CoH on a liver biopsy to be a useful predictor of early PBC; however, we also found a patient who had bile duct injury on H&E stain, but no evidence of loss of CoH on K-19, highlighting that while loss of CoH can be a harbinger of early PBC,4 this finding may not be consistently present in early PBC. PBC can adversely affect the quality of life even in its early stages, and a higher mortality not related to liver disease has also been reported for patients with PBC, thus justifying a full work up in all AMA-positive patients.5 33 Moreover, it is becoming clear that some AMA-positive patients would have changes of PBC and/or NAFLD regardless of the pattern or degree of elevation of liver enzymes. As the treatment of PBC differs from NAFLD or alcoholic liver disease, the documentation of both diagnoses in a patient will help a clinician to come up with a comprehensive management plan for each AMA-positive patient. As many patients with a positive AMA do not have PBC at the time of AMA testing, some might argue that there is no need to order a test that can lead to further work up, costs and patient anxiety and thus potentially avoid a liver biopsy with its inherent risks.1 It is, of course, important to remember and discuss with patients that a liver biopsy is an invasive procedure that has high cost, is limited by sampling error and observer variability and has risk, although limited, for serious procedure-related complications.34 35 Fortunately, there have been multiple advances in recent years for non-invasive liver disease evaluation, including particularly MRI proton density fat fraction and MR elastography for quantification of steatosis and fibrosis36 and elastographic methods for assessing fibrosis, including FibroScan (Echosens; Paris, France)37 38 and real-time 2-D shear wave elastography done with the SuperSonic Imagine Real-time ShearWave Elastography ultrasound system (Aixplorer, Aix-en-Provence, France).39–41 The addition of the Controlled Attenuation Parameter software for use with the FibroScan system has also made accurate assessment of steatosis possible with this elastographic system,42–44 with the XL probe improving the accuracy of liver stiffness measurement in obese patients.45 The availability of these new modalities for liver disease evaluation may give us the opportunity to perform a thorough non-invasive analysis of AMA-positive patients, eliminating for at least some patients the need for a liver biopsy. INOVA Diagnostic Inc. Quanta Lite M2EP (M1T3) Elisa, 2005. Contributors All authors have participated in preparing this manuscript including data collection, data analysis and manuscript writing. All the authors agree with the contents of the manuscript.